We are happy to announce the support for secure pages using the SSL protocol! Until today, visiting secure pages which embedded our code would trigger a warning message in some browsers. As a result, website owners refrained from using our service in secure pages, and sometimes even in their entire website! Fortunately, this unpleasant situation has come to an end. The service now fully supports secure pages, so that the browsers won't warn about a security problem and frighten your visitors. Support for secure pages exists in the Premium plan only. If you have purchased the Premium plan or you are still in your trial period, you may benefit from the new support. All you have to do is to update the embed code from your Control Panel. If you are in the Free plan, secure pages will not close and the seal which confirms that your website observes Shabbat will not show. We have added instructions for embedding our service on websites based on the Weebly platform. If you own such a website, you may now integrate our service easily and without requiring any technical knowledge! For the embed instructions, click "Info" on the top menu, and then select the "Embed Instructions" tab. We have added instructions for embedding our service on websites based on the Joomla platform. If you own such a website, you may now integrate our service easily and without requiring any technical knowledge! Thank you Uri for requesting these embed instructions! On Wednesday, March 20 2013, an item about HolyClock was aired on Reshet Bet radio station, in the "Giga-Bet" show - the radio program about Internet, science and technology, edited by Nicolas Rosenbaum and presented by Menachem Granit (guest in the studio: Silvio Pinco). Menachem Granit: "The next website is HolyClock. Reminds me a little of Holy Grail for some reason... Anyway, what does this website do? It is intended for Shabbat keeping surfers and also website owners who do not want their websites to be visited on Shabbat. HolyClock provides a service for closing websites on Shabbat and Holidays. The closing occurs before Shabbat enters, for each visitor individually. It meaning that if you are situated in Honolulu, it will use Honolulu time, of course based on your location on the globe. Thanks to this service, you can prevent desecration of Shabbat by visitors of your website. A visitor who is located where Shabbat has begun, is redirected to a temporary closing page until Shabbat ends. Now, this sounds very interesting and positive. There is a free plan and also a Premium plan, that..."
Silvio Pinco: "What does it do?" MG: "I don't know, I guess it serves you more efficiently." SP: "I wonder what they do if, suppose someone from the international space station enters the website..."
MG: "The question is whether they can surf, that's the question." SP: "No, they surf, yes." MG: "If they have Wi-Fi up there." SP: "They do, they do. Will they have access on Shabbat? When is Shabbat up there?" MG: "We will submit this as a question to this service, the Holy Clock." 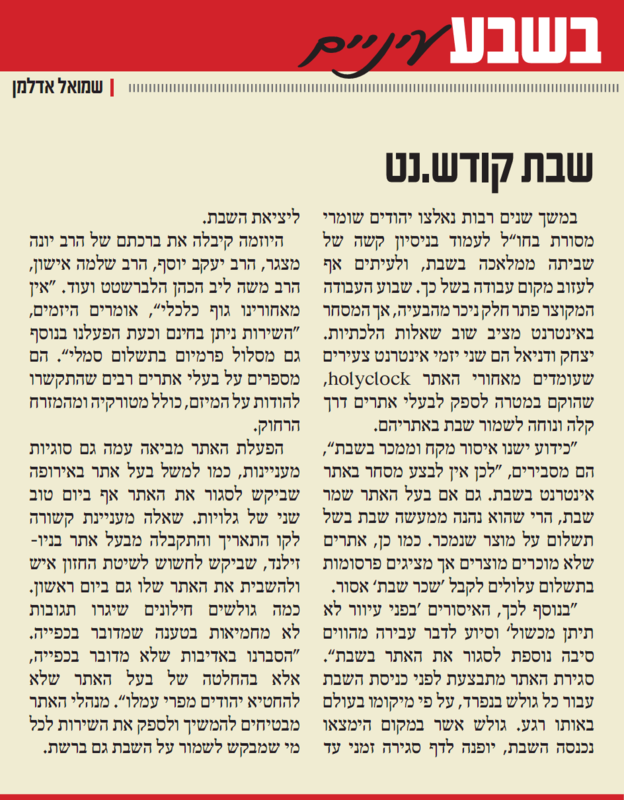 Today, March 21 2013, an article about HolyClock was published in the Israeli newspaper for the religious sector, "Besheva". For many years, observant Jews abroad had a hard time ceasing all work on Shabbat, sometimes to the point of having to leave their place of work. The shortened working week has solved a major part of the problem, but commerce over the Internet raises again halachic complications. Yitzhak and Daniel are two young Internet entrepreneurs who stand behind "HolyClock", a service with the aim of giving website owners an easy and convenient way to observe Shabbat on their websites. "It is well known that it is forbidden to buy and sell on Shabbat", they explain, "thus one should not perform transactions over the Internet on Shabbat. Even if the website owner observed Shabbat personally, by receiving payments he is part of the prohibited act. As such, websites that do not sell products but sell advertising banners may receive forbidden 'Shabbat payments'". "Additionally the prohibitions 'do not obstruct a blind man' and 'complicity' by promoting others to forsake Shabbat, are another reason to close the website". The website closing occurs before Shabbat enters, for each visitor individually, based on their physical location in the world at the given time. A visitor who is located where Shabbat has begun, is redirected to a temporary closing page until Shabbat ends. This initiative has been beatified by Ha Rav Yona Matzger, Ha Rav Yaacov Yosef, Ha Rav Shlomo Ishon, Ha Rav Moshe Liv Ha Cohen Halbershteit, and others. "There is no economic body behind us", say the entrepreneurs, "the service is offered for free, and we have now introduced an additional Premium plan for a symbolic fee". They mention numerous website owners who expressed their gratitude about the service, and sent their blessing including from regions such as Turkey and the Far East. The service operation brings some interesting issues, such as a European website owner who asked to keep his website closed during the Second Day of Holiday in Diaspora. An interesting question, related to the halachic dateline, was received from a website owner in New Zealand, who wanted to conform to the Chazon Ish's system, and restrict access to his website also on Sundays. A few secular surfers sent uncomplimentary comments, arguing religious coercion. "We gently refuted religious coercion, explaining that it is the website owner's decision to prevent desecration of Shabbat by Jews from the fruits of his labor". The website operators promise to keep providing the service to all who request to keep Shabbat also on the Internet.